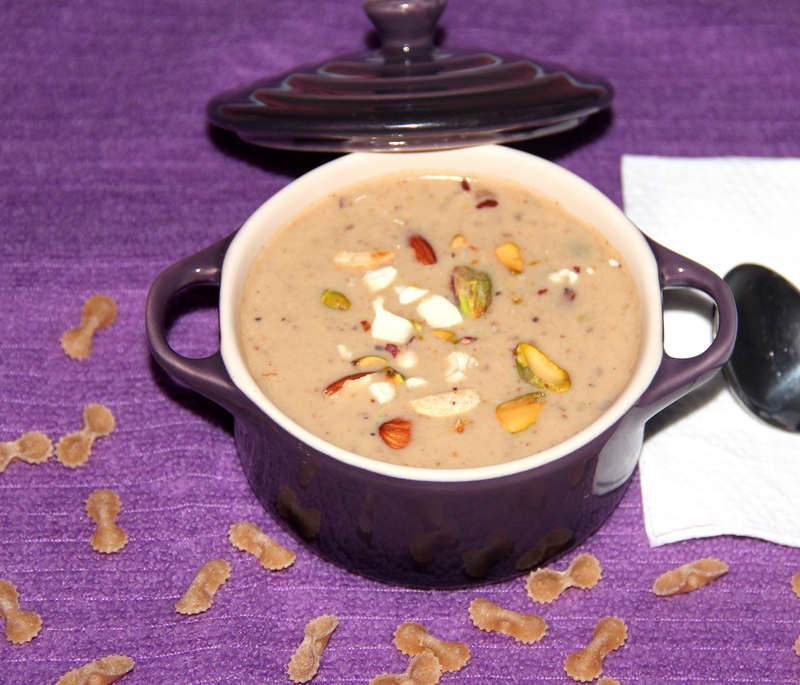 This is a very rich kheer recipe. which is simple. As a variation used mini pasta shells instead of rice or vermicelli. This recipe is Veganised by adding coconut milk. A variety of roasted nuts added to recipe makes it nutty and crunchy in every bite. Combine coconut, brown sugar in the blender/food processor and pulse until sugar blends well with coconut and set aside. Cook pasta in the boiling water until 3/4done (about 4-5minutes) drain and set aside. In a thick bottom pan combine coconut water, coconut milk, mix well and bring it boil on a medium-high flame. Add 3/4th cooked pasta and cook in the coconut milk for 3-4minutes. Then add blended coconut-sugar mixture and continue to simmer for 8-10minutes/until it thickens little bit. Turn off the flame, add cardamom powder mix well. Top it with roasted-crushed nuts. Serve hot/refrigerate and serve chill. Blending coconut/sugar helps sugar to blend well. Posted on August 27, 2014, in Indian, Sweets, Vegan and tagged Chitras healthy kitchen, drchdietfood, Vegan desserts. Bookmark the permalink. 28 Comments. Oh my Chitra! How did you come up with this! Thanx Radhi. …its dad who gives me thoughts so nothing from me dear. …This was not planned just an instant thought and try so credit goes to my dad god. ..thanx a bunch for your encouraging words dear…. This is my favorite Kheer, I am craving for it now. Chitra, I love the idea of using other shapes of pasta! Looks really delicious! Sounds delicious. I presume it would work just as well with the traditional vermicelli? or would I need to make changes. If using small pasta, do you mean the really small bits used in soups? The flavours sound delicious – I just need to be clear about the pasta. Thanks for explaining about the pasta. I suppose really the size is just a matter of choice, presentation, or what one has on hand.